Cat Stevens has cancelled his New York concert, weeks after announcing a six-city tour. The singer said on his Facebook page that he would not keep the December 7 New York engagement because its requirement for paper tickets had led to exorbitant resale prices. 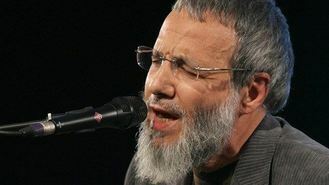 London-born Cat, 66, also known as Yusuf Islam, the name he claimed after becoming a Muslim, announced earlier this month that he planned a concert tour behind the blues album he is releasing on October 27. The concerts are his first series of shows in North America since 1976. Cat says he is a long-time supporter of paperless tickets "and avoiding scalpers" and hopes to return to New York City in the future. Take That star Jason Orange has revealed he has quit the group. AC/DC have confirmed founder member Malcolm Young has left the band because of illness and is being replaced by his nephew. Jamelia has admitted she is embarrassed by some of the skimpy outfits she wore for her videos. Sheridan Smith's portrayal of Cilla Black in the ITV biopic has propelled the scouse singer back towards the top 40. Placebo have returned to the UK for the first time this year as the British rockers became the latest act to headline the 2014 iTunes Festival. Barbra Streisand has made history by becoming the only artist to have number one albums in each of the last six decades. Kelis has admitted she doesn't actually like milkshakes - despite making her name singing about them. Bryan Ferry has announced that he is releasing a new studio album. Aston Merrygold has landed a solo record deal.